Farm to ____ is a powerful marketing term these days that is sadly beginning to lose its credibility. Just because something is grown on a farm that winds up in a product that makes it to our plates or glasses doesn’t always mean all aspects of its production are overseen by the brand behind it or that the ingredients were grown adjacent to the property at which they are manufactured or presented. There are some shining examples of good farm to table or farm to glass businesses, however, and one of these is Ransom Spirits outside of Portland, Oregon. Ransom winery and distillery was founded in 1997 by Tad Seestedt, who came to the Pacific Northwest with a thirst and a dream of leaving the 9 - 5 office life for a career as a winemaker and distiller. Seestedt grew up on a farm, but he says that after high school he thought he would never want to work on a farm again, spending all that time sitting on tractors and shoveling manure. However, after holding several city office jobs, the allure of a “rural lifestyle” called him back. He says, “I was really into wine and how wine pairs with food and decided to try working in the wine industry to see how it fit. I went back to night school for chemistry and biology, read books on growing grapes and drinking wine, tasted lots of wine, thought about it, talked about it... Then decided to move to Oregon and get a job in the wine industry.” He says he worked in wineries for 4 - 5 years before starting Ransom. One of the most unique products from Ransom is a Dry Gin, which is a nod to the malty style of Dutch genever with a decidedly more aromatic palate, giving it the weight of the genever with the refreshment of a London Dry. It’s made from an in-house base wort of malted barley and rye mixed with corn-based spirits that have been infused with certified, organically-grown juniper and other botanicals, including Oregon-grown Marionberry (no relation to the controversial former mayor of Washington, D.C.) and local hops. 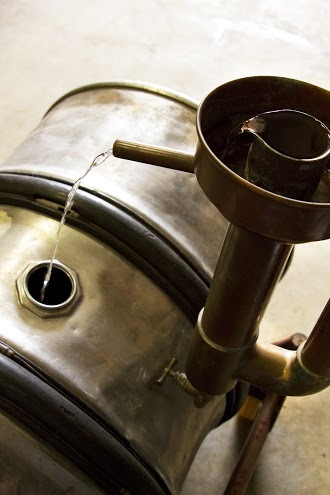 The gin is distilled using a direct fire-fueled alambic pot still. It happens to go exceptionally well in a Martini mixed with Ransom’s Dry Vermouth. While many vermouth producers have to source their wine, Seestedt has the luxury of starting his vermouth with a blend of aromatic white wines vinified at the Ransom winery and mixing it with his own alambic-distilled brandy aged in French oak. The botanical infusion combines rosehip, chamomile, verbena, spearmint and other aromatics with vanilla. It also includes a healthy dose of wormwood, an ingredient most American vermouths leave out because of pesky government regulations surrounding it. Wormwood is not only the main ingredient in traditional European recipes for vermouth, it’s also a required component of absinthe, perhaps the most misunderstood of all spirits. Says Seestedt, “There’s a lot of hype about the psychotropic effects of wormwood. Keep in mind, most absinthe is a pretty high proof product, so if people were drinking significant amounts of it, I would guess it was probably the enormous amount of alcohol that would cause them to do the bizarre things they were accused of and not the wormwood in it. Another fascinating product from Ransom is the Emerald 1865 Whiskey, a modern American interpretation of what had been a traditional Irish whiskey recipe. This is one of the collaborations with David Wondrich, whom Seestedt first met in the 1980s when they were both working as paralegals in New York City. Seestedt says he enjoyed going to hear Wondrich play live with his punk band, and a kinship was formed. However, the friends lost touch when Seestedt left New York to travel Europe. Upon his return, the number he had for Wondrich no longer worked and so he thought he’d been lost for good. It wasn’t until a few years later that Seestedt was reading a cocktail article when he saw his old pal’s name on the byline and thanks to the internet, found a way to get back in touch. Coincidentally by then they were both working in the beverage industry, just different ends of it. Now that Seedstedt is back in the farm life he’s content with his accomplisments. The spirits he produces are truly top notch examples of what farm to bottle should be about. After life’s twists and turns, he’s back on the tractor for now, but luckily not shoveling manure, either literally or figuratively. Old Tom Gin: a collaboration with David Wondrich that provides a truly historically accurate rendering of this classic style. Dry Gin: Where malty genever and aromatic dry gin meet, it has deep cereal flavors and a balanced floral finish that feels truly informed by its winemaking roots. Whipper Snapper Whiskey: aged between 6 months and 2 years, this a youthful whiskey with an old soul. It’s a rare example of a young American whiskey that doesn’t taste like it was just hastily thrown in a bottle to earn a buck. The Emerald 1865 Whiskey: David Wondrich hunted down some old microfiche (kids, ask your parents) to come up with this traditional recipe for Irish Whiskey made with oats. You’ll try it for the experience, but want to keep drinking it because it’s awesome. Dry Vermouth: Wormwood. So misunderstood. So delicious. It certainly helps that the base wine used to make this vermouth is also of exceptional quality. Highly sippable on the rocks, but does wonders for a Martini.